*H-bridge bipolar constant phase flow driver. *The maximum output current is 4.0A (eight optional). *Up to 32 segments of six kinds of sub-modes available. *The input signal high-speed photoelectric isolatio. *Standard common anode single pulse interface. *Semi-enclosed chassis can adapt to a more demanding environment. *Provide energy saving semiautomatic current lock function. *Built-in thermal protection and over-current protection. *1 x TB6600 Stepper Motor Driver Controller. *This driver is the upgraded version TB6600, heightening segment to 32 subdivision, suitable for high segmentation applications. *For step motor: 42, 57, 86 type 2 phase 4 phase (4 / 6 / 8 line). 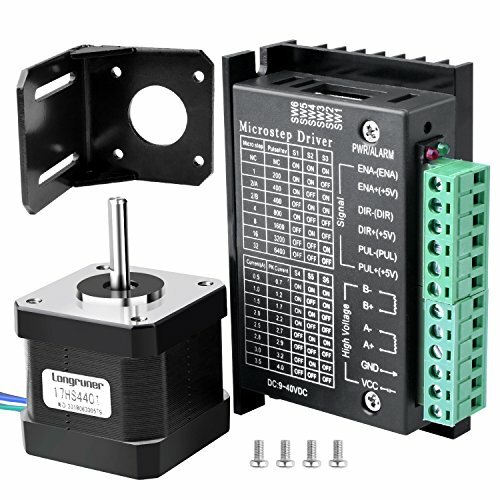 Stepper Motor -NEMA 17 model, 3D printer motor with 40Ncm(56.6oz.in) high holding torque. Technology Support - Professional Engineer Team is on standby to provide solutions for your questions. 9V-40V DC power supply, H-bridge bipolar constant phase flow driver, up to 32 segments of six kinds of sub-modes available. Maximum output current - 4.0A (eight optional). Rated current - 1.7A & resistance 1.5ohms.